On the night of midwinter’s eve, a storyteller takes his listeners back to the Dark ages and a tale from his youth.Deserted by its Roman masters, Britain has been invaded by the Saxons at the invitation of Vortigern, traitorous leader of the Britons. Now, as the tribes unite to reclaim their land, one man must rise to lead them and become their true and only king. Usher and Cal are simple boys from the village… Until someone kills their families and friends one night. They don’t want to run away… They want revenge. I’m not one of the people who grew up on King Arthur tales, but I still enjoyed Shadowland. The author used an unique way to tell this tale. You may thing “It’s boring as I already know how it ends!”. To be honest, I thought that too, but it changed with the first page. A lot of magic and amazing battle scenes – that’s it. One thing I didn’t like is that beginning is written much better than the ending. I still couldn’t stop reading because I was wondering – why Usher and Cal are telling the story to kids… So many years later? If you like fantasy, prepare yourself for an amazing journey through the dark ages… And buy yourself a copy. It’s worth it! Hello and thank you for being my guest on Disincentive reviews! I know you love the king Arthur tale, but why did you want to tell it in another way? Many thanks for your invitation, it is a great pleasure to be here. I love the old legends that generations have grown up with, from King Arthur and the sword Excalibur to Robin Hood. These stories are often just pockets in time and the reader is often left asking, 'what happened next?' or 'but where did Arthur come from?' it was the idea of King Arthur and Merlin the Druid that drew me into the idea for Shadowland. My story is not about Arthur but his father, Uther Pendragon. There is nothing in the history books that tells us about Uther but there are references that Arthur's father was named Uther, and I decided he must also have been a king. In the Arthur legend, Merlin is already an old man, I have him aiding Uther while he enjoys his middle years. 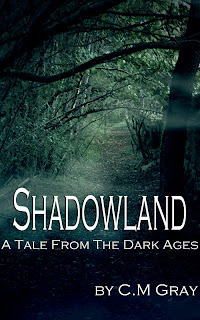 Shadowland is set in the dark ages and they are called 'dark' ages because of the lack of details in the history books. Nobody really knows what happened for a period of about 500 years. It was very tempting to fill in a few gaps! Do you have any other favorite tales? The cover to Shadowland is actually made with a photo I took in Burgundy France, in some woods close to the Castle at Chateau Neuf. It was my first attempt and came out too light. it took help from a fellow Goodreads member, Jussy to make it darker and more moody, something that better reflected the dark ages and Shadowland. I hope you like it? Are you planning to write another book soon? I now have my second book in its final edit, in fact It should be available by the time you read this. My second book is called The Flight of the Griffin, it's pure fantasy and tells the story of five orphaned kids who live on a boat, The Griffin. One of them is a little ... light fingered, as we say in London, he is a thief. He breaks into a merchants house and empties the safe. What he finds sets them against some pretty evil characters as they race to complete a spell started a thousand years ago. It's a fantasy adventure that races along, drawing the reader on a roller coaster ride! Lots of magic, demons and adventure ... a very different book from Shadowland which, although an adventure, is just a little more rooted in reality .... well, just a little anyway. Okay… Now random questions so my followers can get to know you J Tell me your one phobia. I've had several really awful jobs. I spent three months laying tar for car parks when I was young, that was horrible. The smell made my head ache, the heavy work made my back ache and the heat was unbearable as it was mid summer. Another job I had was as a carpenter in mid winter, working outside changing door and window frames in government housing. It was nasty and it was freezing. I finished my six month contract in mid March and flew to India to warm up on a beach. I was 19 years old at the time and spent the next seven wonderful months exploring India from far in the south to high in the north in Nepal and the Tibetan border. I think I get a lot of the imagery for my writing from that and other trips I have made. I've been lucky to live in a number of countries in Asia and the middle east. I currently live in Spain. It’s the end now.. . Anything you’d like to add? Chris offered to give away his book to TEN people! :) Don't you think it's amazing? Bok will be "delivered" as smashword free download coupon. You can download every format form smashwords. If you don't have a account there, make it, because it's amazing site and you can find books for free often... Just saying. Giveaway is open for everyone. IF YOU WIN, PLEASE WRITE A REVIEW IF YOU LIKE IT! It would be the best "thank you" for Chris. This book sounds excellent! Thank you for this opportunity. Love the blog! Hi, I'm Dorothy from book blogs. You have a really nice blog here and I am now a follower. :) I'd love if you followed back. Thanks!